My husband and I went to San Francisco’s Cherry Blossom Festival this past weekend and had tons of fun! 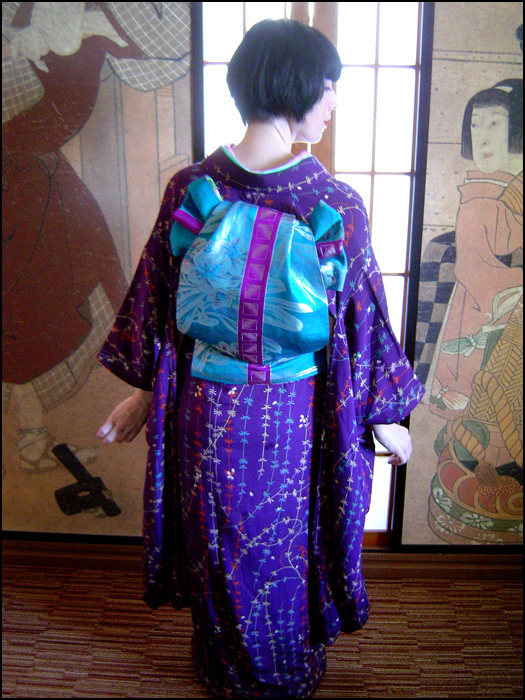 It gave me the oportunity to wear my two “new” kimono: my Taisho komon furisode hikizuri, and my crazy Taisho “shishi inside yabane” komon! 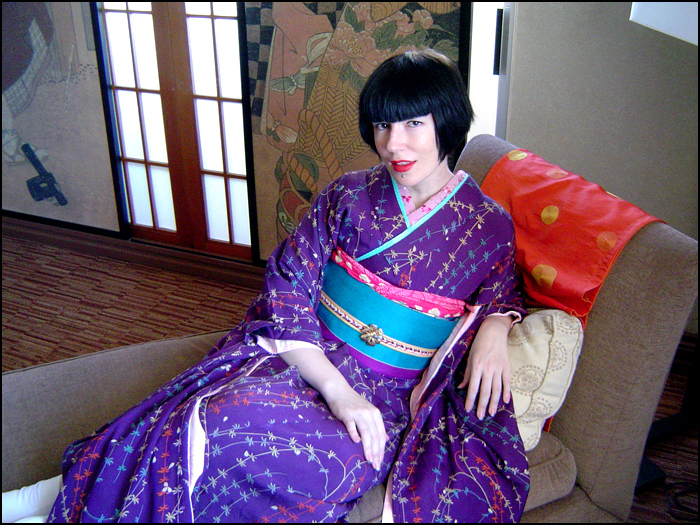 This was the first time I’ve ever worn furisode…or done furisode kitsuke on myself. Thankfully it wasn’t too shabby. 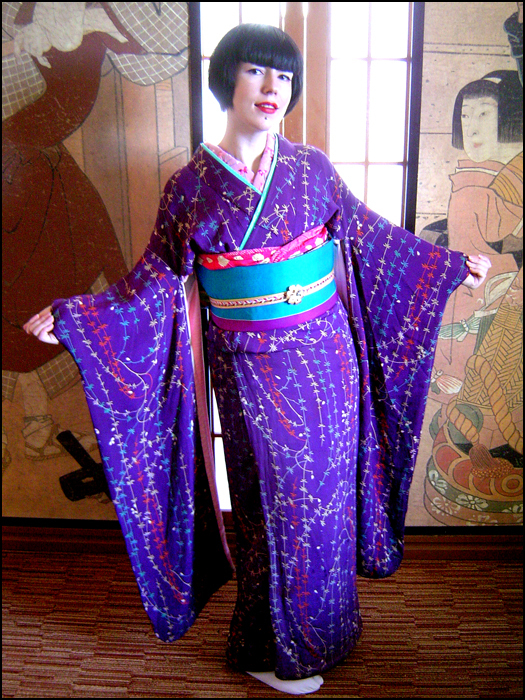 While this furisode is hikizuri – there was no way I was going to wear it trailing outside! 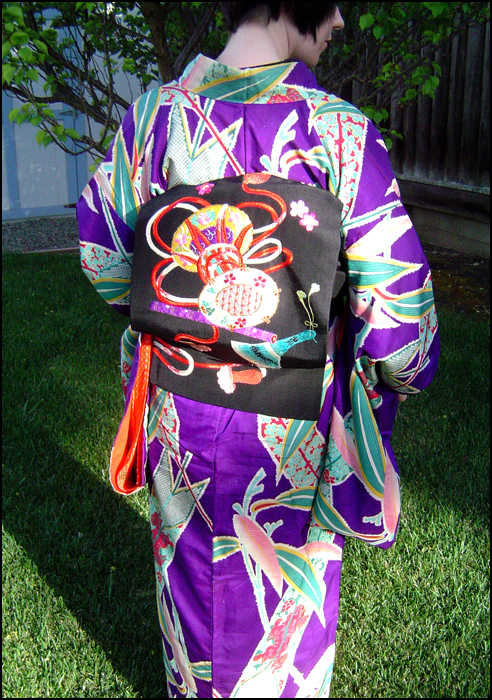 So I just dressed with an ohashori. You can’t see it clearly in these photos – but the pale area of the obiage is a really gorgeous soft, lemon yellow – which happened to match the yellow in the furisode perfectly, along with the yellow in the obijime! 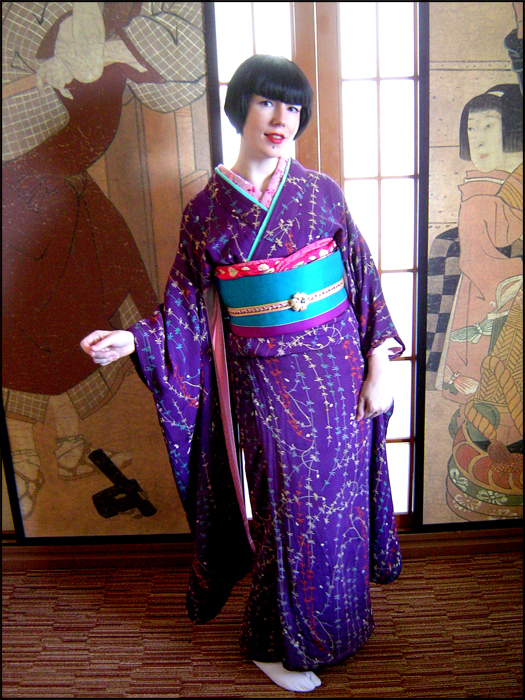 The fukuro obi I chose to wear was vintage – which meant it was a tad bit shorter than modern fukuro – so I couldn’t get a more elaborate fukura suzume out of it. I think it came out relatively ok, though. My obidome was a $3 brooch I won from eBay! 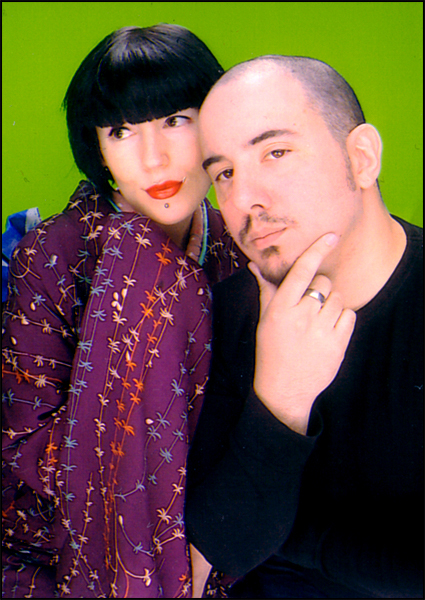 My hubby and I doing purikura at PikaPika! 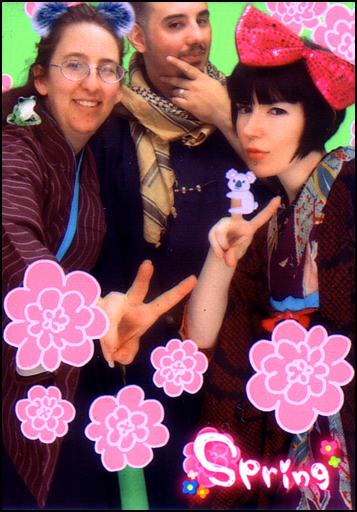 Sunday – more purikura with my friend and hubby! 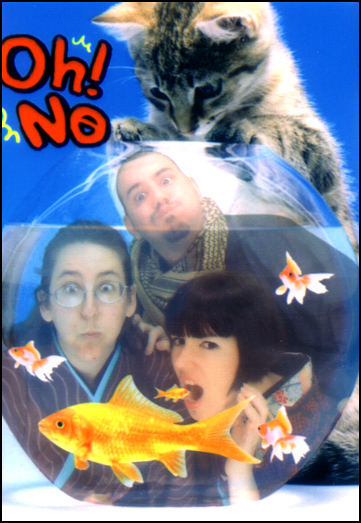 We met a lovely lady who was a kitsuke teacher. She was quite pleased to see us dressed, and impressed we dressed ourselves. 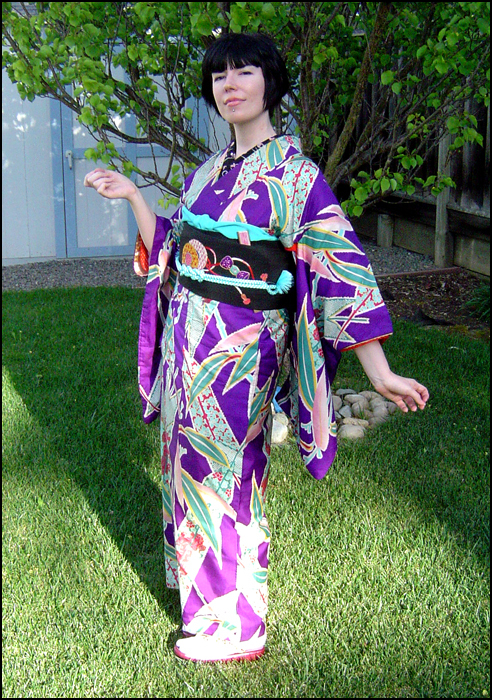 My kimono is crumpled from being in the car for an hour, driving home from JapanTown – but, it’s the only full length photo I have of my awesome shishi yabane komon. Obi all crumpled due to above mentioned car ride….alas! 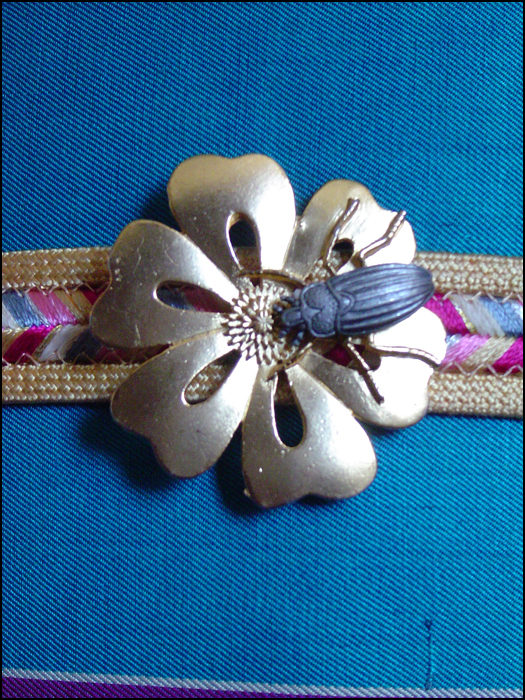 You can see a few more photos and larger versions in my Flickr account! Published in Marie Claire China Magazine! Project Obijime - Restoring Vintage Obijime Back to their Former Glory!